Giving magazine today at www.brethren.org/givingmag. “Not that I am referring to being in need; for I have learned to be content with whatever I have” (Philippians 4:11). If only simple living were actually simple. I recently found my way to a website dedicated to simple living. The author suggested hiring a style consultant to simplify one’s wardrobe. Then one could sign-up for an extensive eight-week course on how to live a simple life. Oh, and I can’t forget the $30 million minimalist house featured prominently on the site. The website made simple living actually look pretty complicated—and expensive! Katharine, a friend of mine, recently went on a road trip that took her near the house of an acquaintance, a woman she had met but was not particularly close to. Katharine values minimalism and thrift, so she asked if she might stay the night with her acquaintance. Katharine later explained to me, “I only expected a shower and a bed and certainly no more than a bowl of cereal for breakfast. But what I received was a full experience: decadent, home-cooked meals; a collection of new friends; great conversation; and the warming of a soul that only comes with hospitality towards the whole person, perfectly executed.” Katharine sought simplicity, but she received generosity. What should we do with this simple-living paradox, this challenge that for many of us today, living simply takes real work? Even when we attempt to live simply, we can end up with another experience entirely. I prefer to look at those who were just as baffled some 2000 years ago. “—Not that I am referring to being in need; for I have learned to be content in whatever I have,” writes the Apostle Paul from his jail cell in Rome (Phil 4:11). Paul had just received a gift from the community of the Philippians, with whom he had previously stayed and to whom he had ministered. Many scholars scratch their heads in wonder when they see the placement of this expression of gratitude in Paul’s letter to the Philippians way back in the fourth chapter of the letter. Why wait until the very end of a letter to acknowledge a gift that was clearly unexpected? Perhaps it’s the same reason that sometimes pushes me to avoid acknowledging gifts that I consider uncalled for, gifts unexpected and truly generous. Gifts can disrupt a pursuit of simplicity, upending plans for a minimalist approach. Paul was a missionary who would not have typically accepted gifts for himself. He was about as far from current-day prosperity preachers asking their congregations for funds to purchase a private jet as we can imagine. For Paul , such gifts would have directly contradicted the humility of Christ he pursued, the self-emptying about which he preached. Far from a response to a planned gift, this passage of thanksgiving says something more about caring for unexpected gifts, treating the gift received with honor, and as a symbol of the partnership in question. Sensibly, Philippians 4:11 qualifies Paul’s motive for writing this piece of gratitude. He’s clear that he knows how to live with little, just as he knows what it is to live with much. Paul writes, “In any and all circumstances I have learned the secret of being well-fed and of going hungry, of having plenty and of being in need” (4:12). And yet, Paul is grateful, reiterating his thanks three times. While Paul didn’t ask for it, as he was accustomed to simple living (though prison is a rather extreme version of simple living), Paul accepted the gift and indicated it would profit the church and others. Paul also emphasizes the long, loving relationship between the Philippians and his ministry. While simple living is not so simple, it can lead to generosity in many forms: generous giving of time, generous giving of money, generous giving of love, and eventually, generous thanksgiving. Philippians 4:11 reminds us, however, that complications arise when attempting to live simply. Epaphroditus, the one who delivered the gift from the Philippians, almost died of illness when he was with Paul. As Paul sought to live simply, Epaphroditus “came close to death for the work of Christ, risking his life to make up for those services that you could not give me” (2:30). Such reminders help to dissuade us from dangerous notions that those who live in poverty have life simple or easy. The gospel is clear in its call to care for the poor and needy. We should not need to be reminded that poverty is hazardous for individuals, households, and society. And yet, for those of us who have much, living simply can become a call to action responding to God’s good and unexpected gifts to us. As Paul indicates, it is a learning process, a sanctification process, even, of being made holy by the Spirit’s good work in us. Like Paul, as we focus on living out the gospel of Christ, we cannot expect that simple living is easy. Together, though, we might find that with God, simple living is faithful. Rev. Adam J. Copeland teaches at Luther Seminary in St. Paul, Minnesota where he serves as director of the Center for Stewardship Leaders. 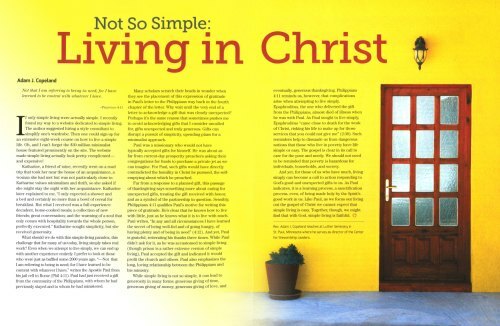 This reflection was originally published in Giving magazine, produced by the Ecumenical Stewardship Center. E-mail ebrethren@brethren.org to receive a complimentary copy of the 2016 issue of Giving magazine. This entry was posted in eBrethren and tagged eBrethren, Giving magazine, Stewardship by eBrethren. Bookmark the permalink.